Given that Abancay is a 14-17 hour bus ride from Ayacucho, and our previous Andes bus experience was less than desirable, we opted for an overnight stop in Andahuaylas. The bus (Expreso Los Chankas 25 PEN/CAD$8.80) to Andahuaylas was eleven hard hours on unpaved winding mountain roads. While the motion sickness/soroche didn’t raise its ugly head again (thank Science! ), I cannot stress how tiring and soul consuming an eleven hour bus ride through the Andes on an unpaved road is. There were several moments of teeth clenching as the bus swerved around precipitous curves, but for the most part the driver seemed cautious and drove at a good speed. The majority of buses that leave for these treks through the Andes leave at night and there are rumours (and crosses at the side of the road as a testament) that buses regularly veer off the edge of the cliffs. The Most beautiful rest stop in the world? The route that we are taking through the Andes from Pisco to Cuzco is not highly traveled by tourists. So we were offered a glimpse of the non-touristy side of Peru. One of our best moments was a “rest stop” we took a lunch break at on the road between Ayacucho and Andahuaylas. There was a market where you could buy all kinds of freshly made snacks. Most guidebooks do not recommend Andahuaylas as a place to stop, but with the bus journeys as long and hard-going as they are, we were grateful for the stop. So we jumped out of the cab, walked down Andahuaylas’ main drag, and found Hostal Andahuaylas (30PEN/CAD$10, double room with cable and private bathroom per night). It was very basic. The room itself had no windows, little ventilation and reeked of paint. There are two types of hostels in Peru: those aimed at foreign tourists and those for Peruvian tourists. This hostel was the latter. No toilet paper, no towels, and the bed felt damp. We were excited to go to sleep just to be out of that room. 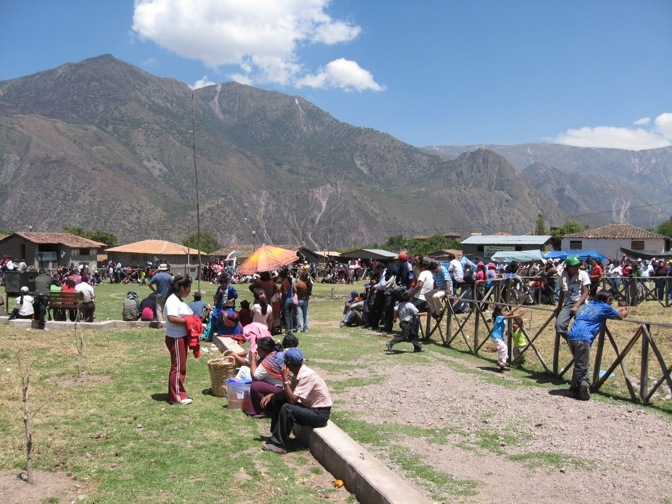 When we arrived in Andahuaylas we had stopped in at the ticket offices to buy a ticket onward to Abancay. We booked a minibus (Ecotur) to take us to Abancay for 20PEN/CAD$7. So at 10am we caught our minibus. They piled our backpacks on top, tied them down and we were away. We sat in the front seats next to the driver and had amazing views the whole way. It took us 4 hours to get to Abancay. We had such a short time in Andahuaylas (and most of it took part in the dark anyway) that we don’t have any photos for this leg of our trip. So check this out. In Abancay we were hoping to find a tour of the Ampay reserve. However, Abancay is not exactly on board with the whole tourism thing and we couldn’t find anything in town. That night we went out to a bar called Bambu Pub right next door to the hostel. It was lucky we didn’t judge it on the exterior alone. Upstairs they have some funky decor including llama wool benches, tables made out of solid tree trunks, and weird movie memorabilia. Despite the fancily dressed waiters they only charged 10PEN/CAD$3.50 for one litre of beer. The Pisco Sours were delicious (and strong) at 11PEN. The next day we did a walking tour of Abancay. It is a beautiful city with a plethora of squares and places to sit and watch people. We saw a young girl with a pet alpaca. Too cute! Women selling various vegetation in the market. We walked the town market which seemed to go on for miles. Close to the market we found a seafood restaurant that had a rooftop terrace with an amazing view. The main square in Abancay. We knew we had to be up early for our 6am bus to Cuzco the next day so we had dinner and hit the sack early. I really wish we had known about this when we were in Abancay! 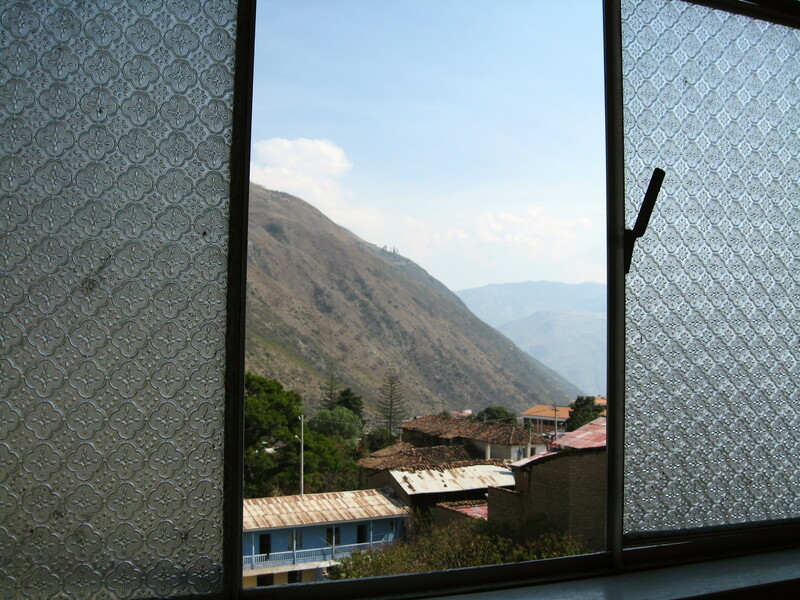 We had purchased our bus tickets to Cusco through Palomino (15PEN/CAD$5.30, ~5 hours) when we arrived at the bus station in Abancay and managed to snag the front window seats (extra leg room – yum!). 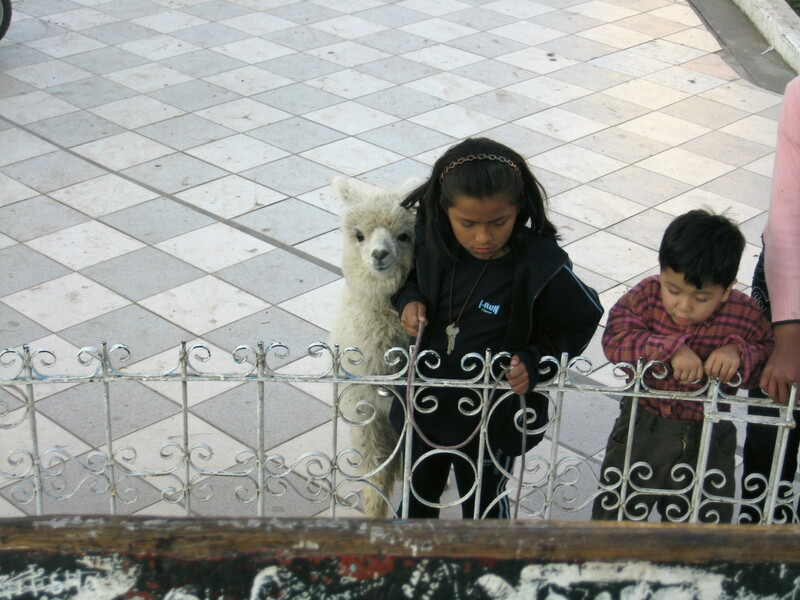 We head to our next stop, Cuzco, 2 nights behind schedule and 62PEN/CAD$22 over budget! To get a better sense of our adventure in Abancay, watch the Abancay video in our backpacking South America series of videos.